When using applications like Character Locator and My Disney Experience in Walt Disney World, you’re going to go through a lot of battery. I usually kill my cell phone in just a few hours by taking and uploading photos and updating Fastpass+. You need extra battery power, FuelRod is one option you may want to look at. FuelRods are the first reusable, portable charging system that allows you to fuel (charge) your mobile device on the go, and then recharge or swap for a fresh one. With the swipe of a credit card you will get a portable charging unit capable of delivering up to 8 hours of additional talk time on the average smart phone, or nearly 4 additional hours of usage on the most demanding of tablets. The FuelRod is the latest technology in portable charging technology with the highest energy density on the market. Recharge it yourself, swap it for a fully fueled unit at low to no cost, or simply return it. FuelRod is the ideal energy solution for today’s mobile lifestyle. Ready to Use FuelRod™ with your smart phone or tablet. For just $20 (it’s $30 to purchase one at Walt Disney World. You can order in advance for the $20 plus $5 shipping fee online though. ), get a portable charging unit capable of delivering up to 8 hours of talk time on your smart phone or nearly 4 hours of usage on your tablet. Android or Apple… The adapters are in the kit and they are yours to keep. Unlimited Swaps FREE for a fresh FuelRod™ as often as you need. It’s simple! Find a FuelRod SwapBox. Insert your empty FuelRod. Out pops afresh, fully charged FuelRod and you can go on about your business. It is that easy. And best of all no empty FuelRods in a landfill. 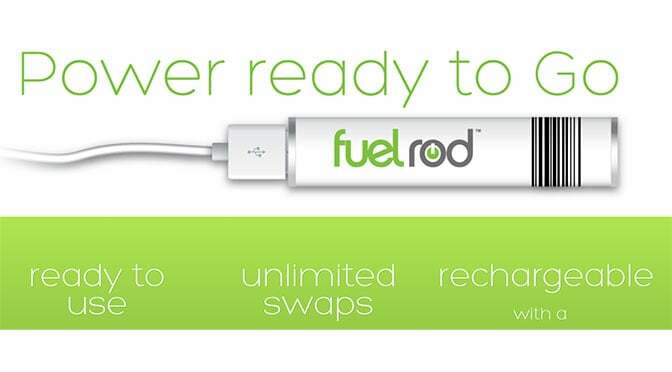 The ability to be swapped (traded) for a fully fueled unit at no additional cost at any FuelRod SwapBox. It’s easily replaceable at a large (growing) number of locations on Walt Disney World property. After the simple purchase process, you just press the “Swap” button on the screen and drop in the used battery. It will spit out a new one in seconds and you’re on your way. It’s small. I carry it in my pocket with my cord extending to my phone. I don’t have to ever plug it in for charging. You can, if you wish, but why do it when you can just stop and drop. The cord they provide is a little short for my needs. I like a little longer cord for flexibility. Doesn’t last very long. I use a Samsung S7 Edge which requires a great deal of battery and it may last 1.5-2 hours for my heavy usage. I keep it connected to keep my phone at 100% and when it dies, I just trade it out when it’s convenient. Can feel pretty warm with continued usage. If I keep it connected to my phone while constantly using my phone, it causes the battery to become fairly warm. I’ve used FuelRod extensively, especially on Challenge Tour days like #WDW47 and they work well for me during these days. I’ll just take a few seconds to switch it out a couple of times during the day and I’ll always have a fresh battery. It’s not designed to be a monster battery like an Anker that you could easily acquire from Amazon (look, I’m the only blogger not selling you Amazon stuff, or FuelRod with affiliate links). It’s designed to be easily and quickly swapped for another battery and it does that job well. I realize that I’m trading convenience for capacity, but I also don’t like having batteries charging all over my room at night. If I’m traveling, finding available charging spots can be a pain or I have to bring a multi-power strip. I also use this to charge my Sony camera in the parks, so I don’t have to keep those plugged in as well. This information will be linked on my Walt Disney World tab on the main menu. If you need an updated list of locations, you’ll find it there. Bought one on Sunday at Disneyland and love it! I had my own charger previously but after a couple of trips, the connection is bad. I love that I can just swap this battery. It’s super convenient! Thanks for this great info! FYI, if you buy them at an airport machine they are only $20 instead of $30 (and no shipping charge). Their website should show if they are at your local airport. Thank you for your honesty- and lack of affiliate links!!! I am quite aware this probably isn’t the cheapest solution but it’s an ideal fix. Is there a way to know where the swap spots are once inside the park (park maps, listed on the rods, etc?) Or would it be best to screenshot your list and reference that? AOA didn’t have one last week, but Coronado did. All Star Movies does as well. Did you find out if Orlando airport actually has a vending machine location? Sanford does, but MCO does not right now. Fuelrod’s customer service is awesome. They are based out of the US and not outsourced! Paula is like taking to a friend! She is very personable and knowledgeable about the product and all services related to the product! If you have a concern or a complaint they are right on top of it! Not that I had a complaint, just an ordering issue and she fixed it right away! Even if you have an issue while in Disney they can resolve an issue with cords remotely and give you a new one at a kiosk! Also if you want to order online before you go and need a “c” adapter you can let them know and they will ship it too you free of charge and after you go home and have an issue, they will replace any time free of charge and no shipping fees! If you order them online you can most certainly use them in Disney! I did find one though they are NOT available in MCO right now. They are adding more locations all the time. If you have any question at all, please call them or email them and they will be able to answer any question you might have. Hmm they were there 6 weeks ago. I’ll check on my next flight. So the question: are they free or are they “little” cost? Especially the ones around WDW, does it cost anything to swap out a dead FuelRod for a fresh one? Corrected. Funny, because that portion of info actually came from the FuelRod website. It’s no additional cost at WDW. Press swap and insert the battery. You mentioned a minimal charge to swap out..can you tell me more about the additional costs besides the initial purchase price..at WWW specifically? And can these fuel rods be swapped out at any location outside WDW? Do you have a picture of one of the swap places to help us know what we’re looking for? Is it kinda like an ATM machine or do I take it to a Cast Member to swap out? Thanks! The service is VERY convenient. And they have it at Disneyland too, now, making it a double no brainer. Hi Kenny! The fuel rods are a good idea. What I also have is a mophie juice pack connected at all times to my I phone, which doubles the battery life. You can get them online at a good price. I also want to thank you for your crowd level estimates for the different parks. THEY ARE INCREDIBLY RELIABLE AND WAY ABOVE ANYTHING THE COMPETITION PUTS OUT. I’ve never tried this, but for $20 it seems like a no-brainer. We take a Trent charger, and that can recharge each of our phones once per day. I wonder if this will become so popular though that the kiosk’s might run out of fully charged batteries? Don’t know about that. I’m sure they hold quite a few though. I’d assume they would add more locations if they saw their customers weren’t being served.